What is Track My Safari? 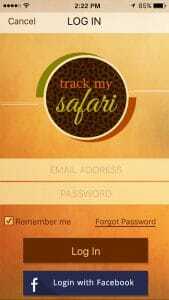 Track My Safari is a mobile app that will add tremendously to your safari experience by mapping and recording your safari game drives. As you take photos within the app, photo waypoints will be posted at the points where photos were taken and you can also drop safari-themed waypoints on the map as well. You can share your safari game drives with friends and family via an assortment of social media channels. To use the app, create a user account by Signing Up with your name, email address and create a password. Then you will be able to Log In using that information. Remember to check the box. Remember Me so that you don’t have to input the data every time. No worries, on the Login page, please click on the link Forgot Password and we will send a new password to the email address you signed up with. Use that password to log in. You can change your password to a password of your choice in Settings. Yes. Tap the drawer icon (top left-hand corner) that will take you to a menu. You will see Settings as the bottom option and you can specify here whether you’d like to use metric or imperials units for distances and temperature. You can also specify whether this is a driving or walking safari and change your password here. Should I log out when I’ve finished a trip? To preserve your battery life, we recommend you log out of the app when you are not actively using it. The logout button can be found in the top right-hand corner of the Settings menu. Drawer icon -> Settings -> Log Out button. Can I run one trip for my entire safari excursion? No. 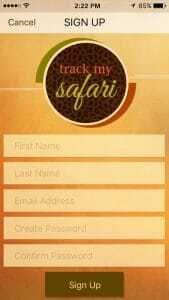 The app is designed to capture each game drive as it unfolds. So, for example, if you go out for 2 game drives on any given day, the app would work best if you created a trip for your first game drive and then another ‘trip’ for your second game drive. 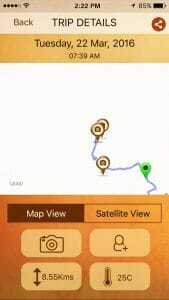 You will be able to see your routes, photos, waypoints etc much more clearly this way. Do I need data to use the app? For best results, you should start each trip when you are connected to wifi at your safari game lodge – before leaving camp. This will give the app a chance to populate the map so you can see it as your game drive unfolds. After starting, the app functions well with GPS functionality and you don’t need access to wifi or a cellular data plan. No. You can press Cancel if you do not want to name your trip and would like for it to go to the system default of date and time the trip commenced. Otherwise, you can give you trip a name if you’d like. What can I do if the app isn’t finding my precise location? You may find you need to tap on the icon locator button so the app can zoom in your location if the GPS signal is weak. On some rare instances, you may see a grid come up rather than the Google map and this is because the app can’t display the map without data. If you press start, you should find that your route will still be tracked, photos saved etc but you won’t see the route until you connect to wi-fi. Tap on the camera icon in the middle of your screen and the device camera will be activated. You can then take your photo using either the front camera or the back camera (when taking a selfie). You will have to select whether to use the photo or discard it. When you save a photo, a photo pin point will be dropped on the map to show where the photo was taken. Tap the flag icon to the right of your screen and the waypoints will come up. Select the waypoint that relates to your current activity and that waypoint will be dropped on the map at your current location. 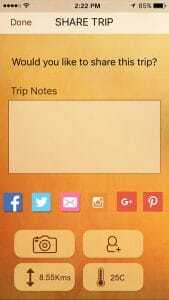 You will be able to review the photos within the app when you are finishing a trip, or reviewing a previous trip. 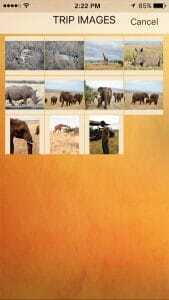 All the photos taken within Track My Safari can be found on your device’s photo library so you can review them at any time. The check-in feature utilizes Facebook so that you can select the location you are at and check in with your friends and family. You don’t have to start a trip to use this function. Just check in when you want to let your loved ones know where you are and what you’re up to. Yes. If you want to remember something specific about the photo you can add notes for any or all your photos. 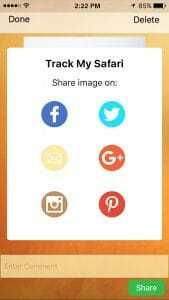 You can share each photo via a wide selection of social media channels : Facebook, Twitter, Instagram, Google+, Pinterest as well as sending it via email. Please note that comments entered in photos will not be posted to Facebook or Instagram as those apps do not allow pre-entered text to be posted to the app. You will have to add any comments about each photo at the time of posting. We would recommend it. Since the app works by activating the GPS location services, your phone battery will be depleted faster when the app is running than when it is not running. Depending on the model of your phone and battery life, you may want to charge your phone between game drives. I’ve finished my game drive. What now? You’re back at camp and can’t wait to exchange stories with fellow travelers but before you do – finish your trip on Track My Safari. To do this, press the Pause button on the left-hand side of your screen and select Finish. Confirm you are ready to finish your trip. If you want to add the names of the people on your game drive, say yes and then tap the Add Friend icon on the top right-hand screen. Type in their name and then add other(s) in the same way. When you get to the Share Trip screen, you can add your trip notes and decide which social media channels you’d like to share your trip to, if any. 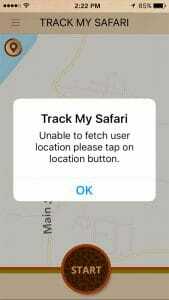 Questions about Track My Safari? We would be happy to answer any questions you may have. Please head on over to our Contact Us page and we will be sure to respond!